Fashion in 18th-century England was of huge importance to people. A new consumer culture was emerging and those who had the means took great care in dressing to impress. With the increase in transportation around the world fashion spread to far-flung places, but people living outside of the urban centres, such as London, were often left behind as they waited for the styles to reach them. As a result, the city dwellers often looked down on their country counterparts when they met at balls. Men’s fashion during the 18th century was as important as the ladies. The men wore breeches with a shirt, cravat, waistcoat and frock coat as their usual attire. For the whole of the 18th-century wigs were fashionable and the men wore their hair cut short with perhaps a lock left long at the nape of the neck and at the forehead which they combed into the wig. The breeches at the start of the century were roomy around the middle. The material gathered at the waist and buttons fastened the opening. By the middle of the century, a flap with buttons over the front was standard. The legs of the breeches were tighter than the top of the trousers and came to below the knee. In keeping with the embellishments of the time, buttons fastened the closing on the outer side. 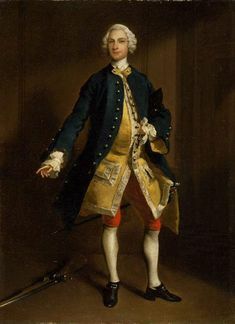 Here the breeches leg met the stockings which came in various styles & colours but were most often white. The shirts were loose and wide fitting. The material gathered at both the neck and the sleeves while lace ruffles finished the look. The men wore their cravat, called a stock, over the neck of the shirt. The stock became popular from the mid-1730s and was a piece of stiff linen, buttoned at the back of the neck. Over this, they wore a black ribbon, known as a solitaire. There were numerous ways to tie it, depending on taste and the occasion. Waistcoats were quite long, coming to just above the coat. Their front panels would be stiff and the fabric often matched that of the coat. As the waistcoat was usually worn under the coat the sleeves and back were never seen and so they were of a less expensive material. Both the coat and waistcoat became shorter and tighter fitting around the middle of the century. This trend continued later into the century with the coat eventually morphing into a tailcoat by the end of the 1700’s. Waistcoats lost their sleeves, which were never seen anyway and breeches continued to become closer fitting as the century wore on. During the 1700’s travels to Italy, on what they called ‘The Grand Tour’, were popular among young English people. While there, the young men seemed to develop a heightened fashion sense. This group of young men who took fashions to the extreme over the course of the 18th century became known as Macaronis. One example of this was the way they increased the size of their wigs to an almost ridiculous scale. The dress for ladies in the 18th century was elaborate, skirts were full and bodices were low. The whalebone bodices kept the ladies waists tiny while the hooped petticoats, which originated in England, gave their skirts shape and grew wider until the mid-century. While in France the size of the hoops increased down the leg, in England they were of uniform width all the way down. Most skirts reached to the ground, but a skirt at ankle level wasn't unheard of. Often the petticoats were elaborate and the gown could have a split in the skirt to allow the petticoat to show. By the 1750’s ladies often wore an informal style of petticoat at home. These had smaller hoops on either side of the hip, which by the next century morphed into the bustle. The lacing of the bodice could be either at the back and masked by the dress, or at the front to form part of the design. They were quite elaborate in themselves with embroidery or brocading and were not for hiding away. Sometimes the ladies wore a stomacher, which was a decorative piece of stiff material pinned in place at the point where the bodice and skirt met. 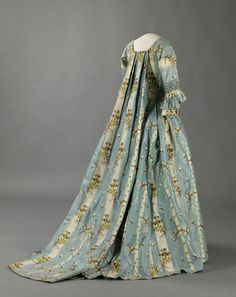 The sack dress which originated in France became widely popular in England from the 1720’s until the 1780’s. It was an ample dress which began in pleats at the shoulders, gathered at the waist and then fell into plentiful skirts. The back of the dress had a number of pleats in the middle of the back and then flowed loosely with the rest of the skirt. The sleeves on these dresses were tight fitting and came to below the shoulder. The cuff was small until the 1740s and but then made way for larger ruffles of the same material as the gown itself. Until the Enlightenment period, people considered children to be small adults. And so, they wore the same clothes as their parents. Children’s clothes weren’t designed until much later in the century. 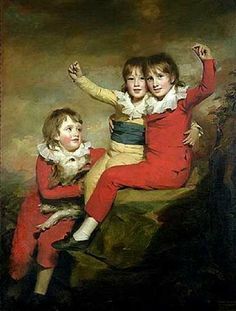 Until this time little boys wore the same outfits as the adult men from the time they were three, while girls began wearing gowns at the age of two. Babies wore a boned bodice under a long skirt and all children wore a bodice or stay, with a cane as support until the 1770’s and 80’s when the practice began to fade out in England. 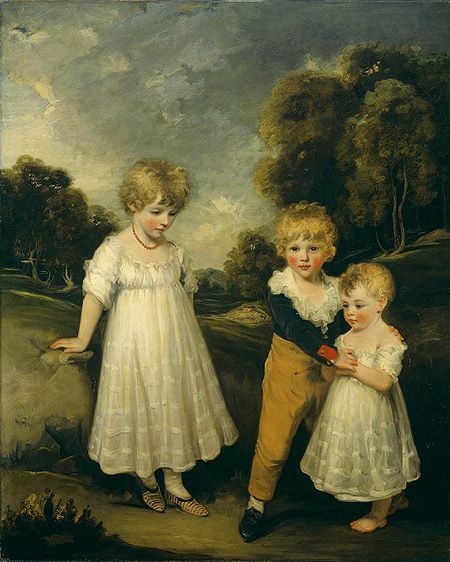 From the 1760’s, children’s clothes began to differ from their parents’. The girls wore a simple high-waisted muslin dress until their teen years. Boys began to wear trousers after infancy until the age of about 10 when they would move onto the adult style of clothes. With their trousers, they wore a shirt with a frill collar and short jacket with a sash around the waist. It was in the last decade of the century that the skeleton suit, which became very popular until the 1830s, emerged. The clothing of 18th century England saw the men’s style become more casual over time, while the ladies gowns got bigger and bigger. As Enlightenment values developed a new approach to caring for children, it was at this time that children's clothes finally appeared, allowing them to be distinct as children rather than miniature adults. Source: Nunn, Joan. Fashion in Costume 1200 – 2000. Herbert, London: 2000. About the Author: Susanne Loxton is a Communications Specialist at Aubiz, a compendium of knowledge about companies in her native Australia. In her spare time, she divides her time between exploring the wonders of nature and writing.